Protect your cash and automatically pop your Square Register connect cash drawer. The cash drawer for Square Register is connected to your printer with a manufacturer specific 24v cash drawer interface cable that connects to your printer, so make sure to purchase the correct cable above which is not included otherwise. One cash drawer till does come with the purchase of each box however if you would like an additional cash till you can add those to your order as well. 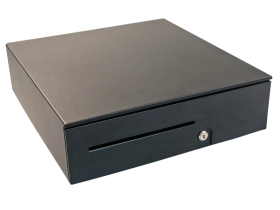 Small in size, the APG Series 100 cash drawer does not compromise efficiency. It actually improves upon it, increasing the effectiveness of your workstation. 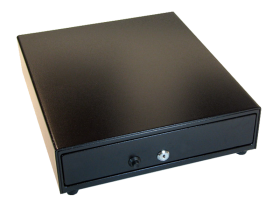 Designed around a full size till, the narrow footprint of the Series 100 minimizes the amount of counter space required. 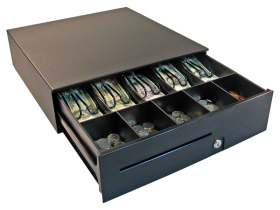 There is ample storage in a deep under-till compartment, to hold coin rolls and packaged currency. An adjustable media slot divider separates and organizes different media types. With features including steel ball bearing slides and a robust latch mechanism, the Series 100 is proven beyond 4 million cycles. A durable till design and the resilient powder coat finish resist the abuse in even the toughest environments. 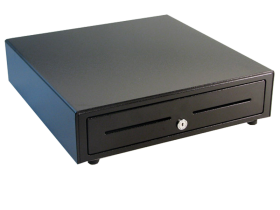 Size, color, interface, accessory and configuration options complete the Series 100 solution. 16.0" x 16.8" x 4.9"